I never pass up an opportunity to visit a city I’ve not been to for a while particularly when it’s as interesting a city as Norwich. Growing up in Wales has meant that I look for hills wherever I go and so the hilly city of Norwich looming up out of the flat plains of Norfolk instantly appealed to me when I visited for the first time over ten years ago. This visit was a treat. A friend and I had a whole afternoon to explore the city, pop into shops, have some tea and generally have a good catch up. 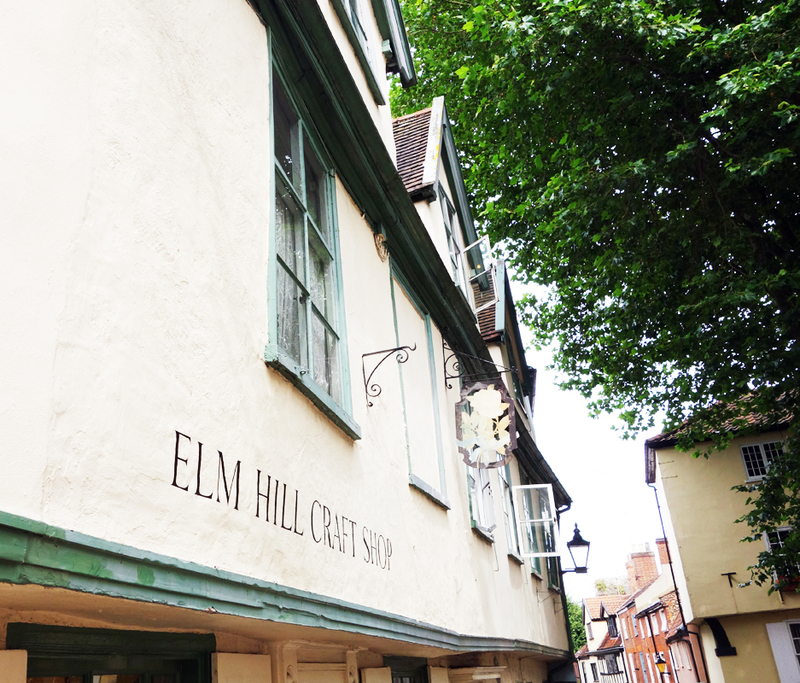 After wandering around the medieval lanes and being surprised at the abundance of cafes, boutique clothes shops and hair salons, we found a fantastic vintage and antiques emporium on a street where lots of little cafes and curio shops had appeared. 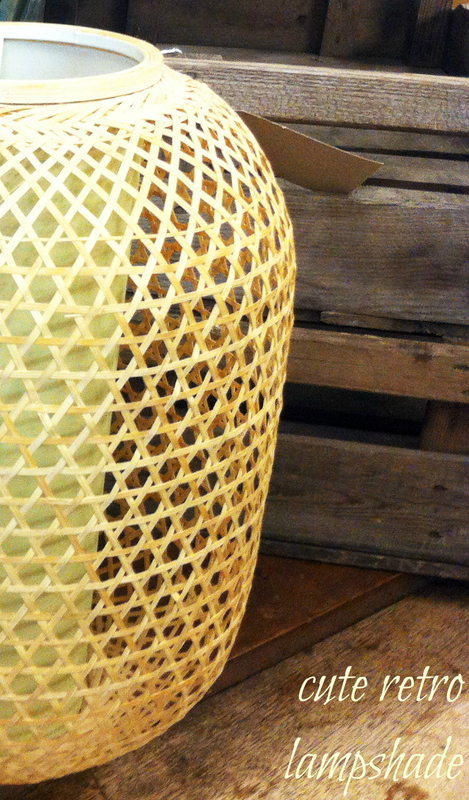 One of our first vintage finds were some 1970s lampshades that tempted me. Not usually a big fan of wicker or bamboo, I liked the simple shape of the outer shades and the clever way that the light bulbs are hidden by the inner tube in keeping with the simplicity of the design. 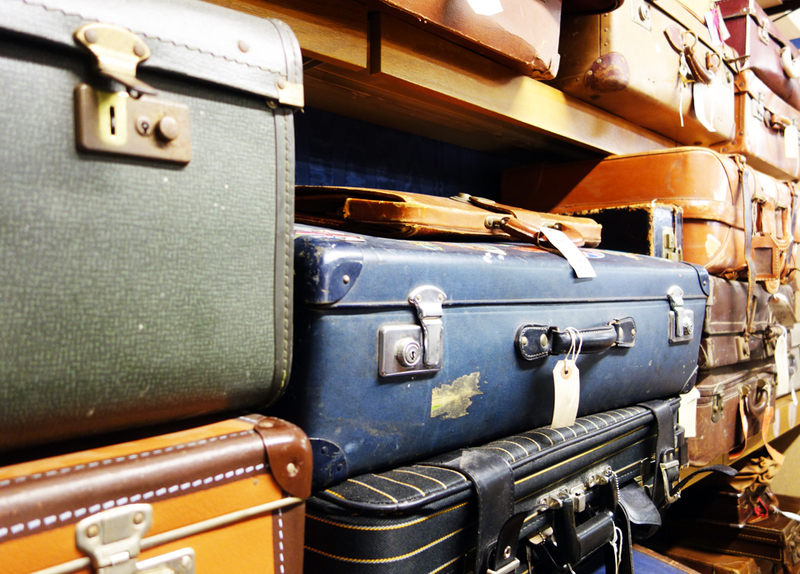 There were lots and lots of vintage luggage cases, and as I love them so much I couldn’t help include a picture of the wall of cases. So many designs and colours! 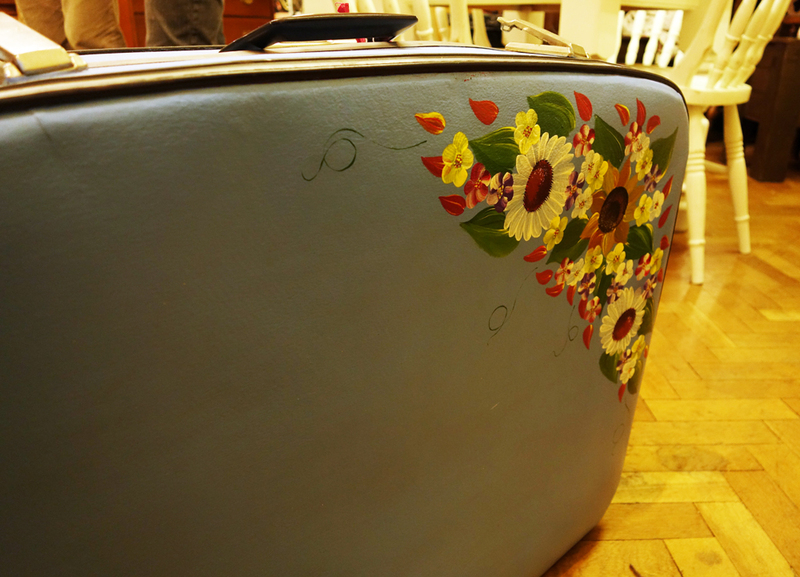 In a different part of the shop, there was a lonely luggage case that had been painted with flowers in the top right hand corner. I don’t know whether the painting was original or whether it had been added recently. 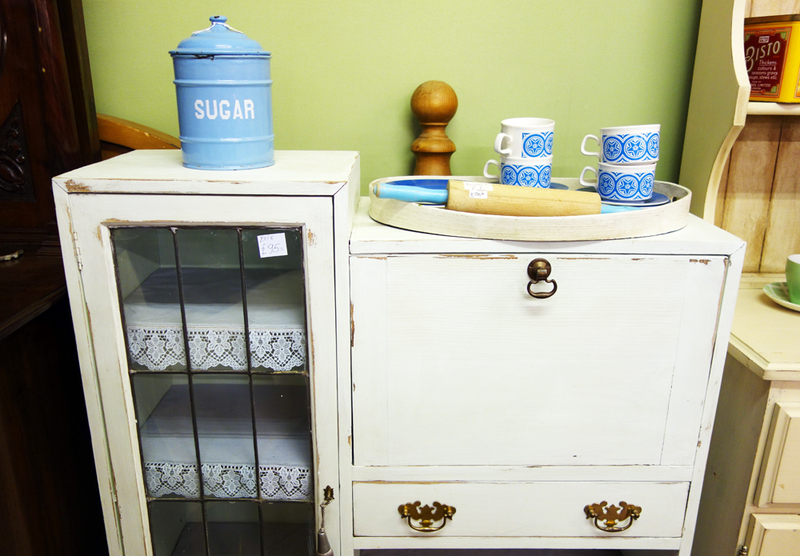 This mini kitchen dresser was nearby and I loved the way that this particular seller had set up their wares in a corner of the shop. 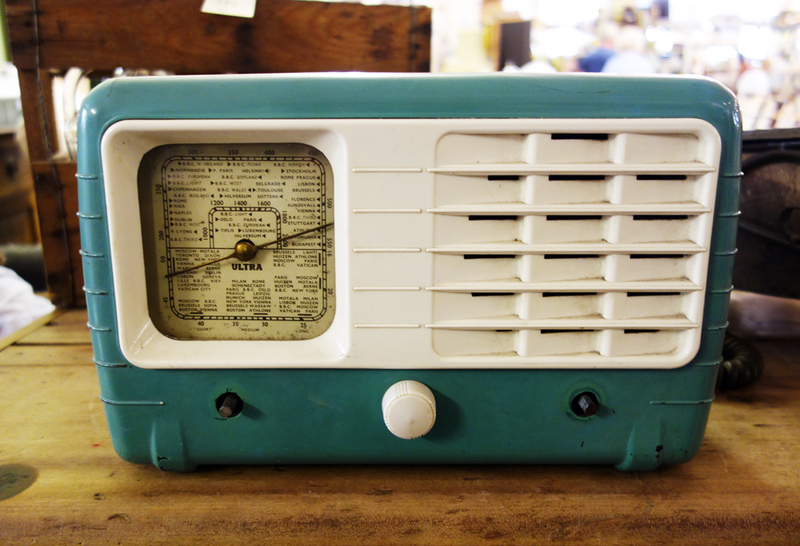 Nearby was this adorable radio. I think the dial on the left shows all the different radio stations. Unfortunately what had started as a sunny afternoon clouded over. Rain halted our leisurely stroll and we looked for somewhere to shelter. We’d spotted Biddy’s Tea Room a little while earlier and managed to grab a tiny two seater couch in the back room. I was sad to have missed out on the chaise longue! Unfortunately none of my photos at Biddy’s came out very well due to the lack of light from the overcast sky so I’ll do my best to describe the scene. There were shelves of beautiful vintage china from the 1930s to 1960s, tea cups and saucers, tea pots, cake stands and in one corner, the fanciest cakes decorated with sumptuous flowers. After marvelling at the china and cakes, we took our time making our way through a gigantic pot of earl grey tea, a huge square of flapjack and an equally huge white chocolate and nut muffin that came with extra cream and a strawberry. To use a popular family phrase, our eyes were bigger than our stomachs! We were the last ones to leave as they shut the café for the day. The next day on the way out of the city we stopped at a small yard sale that a woman and her mum were having as part of a house move. Yard sales aren’t common in the UK with most people choosing to sell their unwanted goods at a car boot sale (for non-UK readers, people park their cars in a designated field or car park and sell their items from the boot of their car). So when we spotted a sign for a yard sale advertised in a cafe the previous evening we thought we’d pop along. More a front garden sale than yard, there were some nice things on offer and after chatting to the owners briefly we each came away with a few things. 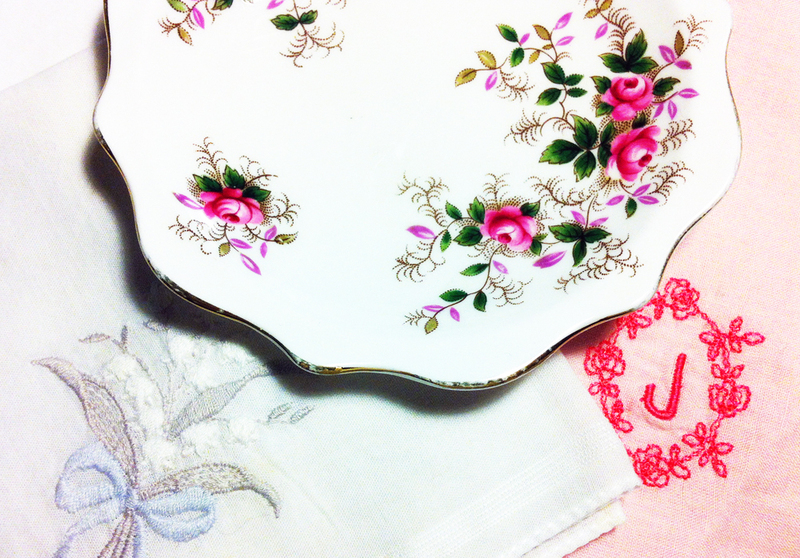 I found this Royal Albert Lavender Rose trinket dish and a set of hankies, some with monograms and flowers, others just with lacy edging. I hope a few more people stopped by to look at their goods.